← Hague Rebukes Israel for ‘Belligerent Language’, But Who’s Listening? Gripped by the Egyptian uprising from the very beginning, as I followed events hour-by-hour my thoughts turned to Naguib Mahfouz’s masterpiece, The Cairo Trilogy. Although my memory of the details of the first volume, Palace Walk, is very patchy, I knew that the 1919 demonstrations against the British were central to the book and rather hazily felt that there was perhaps a parallel of some kind with the current developments. The youth answered angrily, ‘The demonstration today was peaceful. The authorities had given permission for it. Top men from all walks of life participated in it. At first it proceeded safely, until the middle section reached Ezbekiya Garden. Before we knew what was happening, bullets fell upon us from behind the wall, for no reason at all. No one had confronted the soldiers in any manner. We had even forbidden any chants in English to avoid provoking them. The soldiers were suddenly stricken by an insane impulse to kill. They got their rifles and opened fire. Everyone has agreed to send a strong protest to the British Residency. It’s even been said that Allenby will announce his regrets for what the soldiers did. Many things come together to intensify the terrible sadness of this moment, not least Al-Sayyid Ahmad’s feelings of guilt at the way he had treated his son. That very day ‘Fahmy had appealed for his affection and he had reprimanded him’. Al-Sayyid Ahmad also had no idea that Fahmy had been one of the principal leaders of the demonstrations. So the parallel is to 1919. After World War I, Egyptians began demanding independence from Britain, which had occupied the country in 1882. Nationalist leader and politician Saad Zaghlul and others wanted to lead a delegation (Wafd) to the Versailles peace conference to ensure that Egyptian aspirations for self-determination were heard. The arrogant British jailed Zaghlul early in 1919, and thereby provoked huge multi-class and cross-sectarian demonstrations throughout the country. Copts were as nationalistic as Muslims and as eager to see the backs of the British, and they are clearly visible in photographs of the day, carrying banners with crosses on them. Egyptian women also played a visible role in the protests. 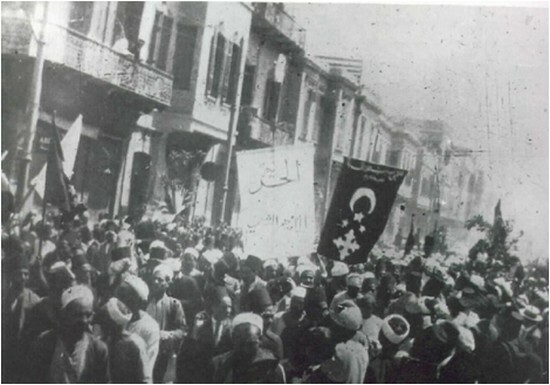 1919 was a foundational moment for the Egyptian nation. The subsequent history of Christian-Muslim relations has had its ups and downs. But at Tahrir Square, Sunday, February 6, 2011 was another such 1919 moment of unity. As a result, Britain granted Egypt independence in 1922 and a new constitution in 1923. But British forces remained in Egypt and Britain continued to be highly influential in Egypt up to the time of the Suez Crisis in 1956.